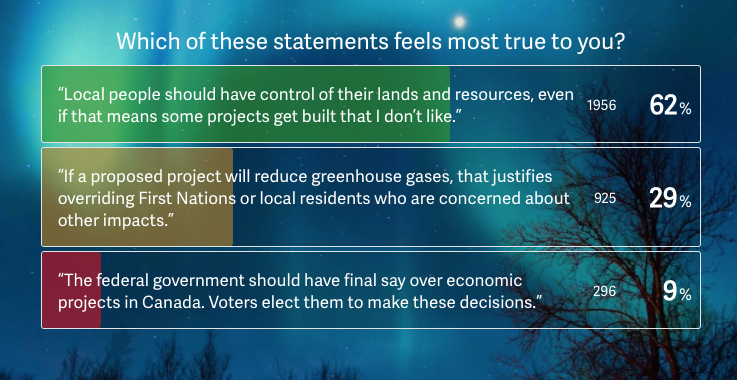 Here’s what thousands of British Columbians had to say. 1. 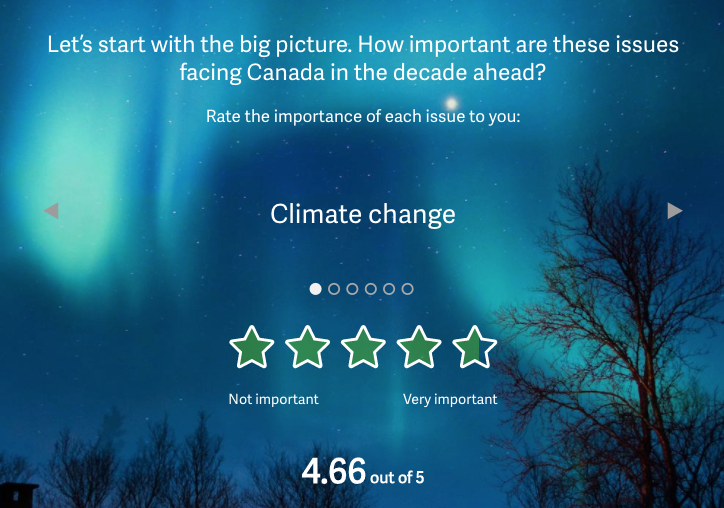 Climate change should be THE thing Canada focuses on over the next 10 years. 2. Environmental protection in our home province is most important. 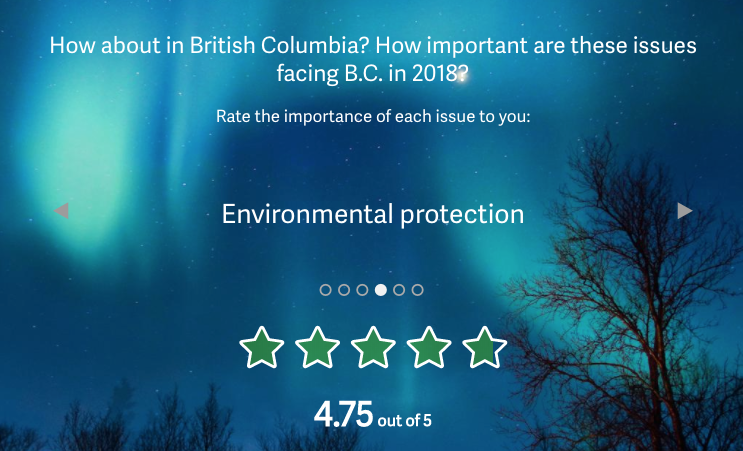 Protecting our environment narrowly beat out climate change on our list of important issues facing B.C. 3. When it comes to environmental priorities, cutting greenhouse gas emissions is top dog. For a lot of British Columbians, taking urgent environmental action means lowering greenhouse gases. 4. 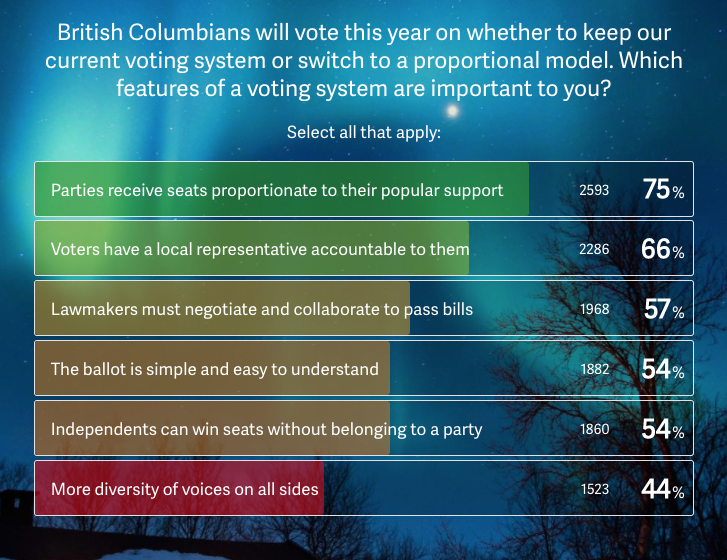 Strengthening B.C.’s democracy means less corporate influence in our political system. 5. Dogwood supporters are optimists. Sure, some folks think we have nothing left to do but batten down the hatches and ride this thing out. But 2/3 of our survey responders have some degree of faith in our political system and believe we still have time to steer this ship back on course. Sounds like a pretty sweet action movie. 6. Local power rules the day. In the face of so-called majority rules or “national interest” (ahem), Dogwood-ers still believe decision-making should lay in the hands of the communities affected by a project, not outside influence or strong-arming from afar. Then there’s the group who trust Ottawa and don’t see what all the fuss is about. 7. It’s too close to call on the fate of Canada’s economy. A shade more than half of us think we can grow the economy while we reduce our impact on the climate — possibly through renewables. The other 48 per cent? They’re not as convinced. But suffice it to say, no one is buying the “we need to build pipelines to meet our climate targets” song and dance the federal government is trying to peddle. 8. British Columbians believe in the power of the mighty pen. This question allowed for more than one answer. 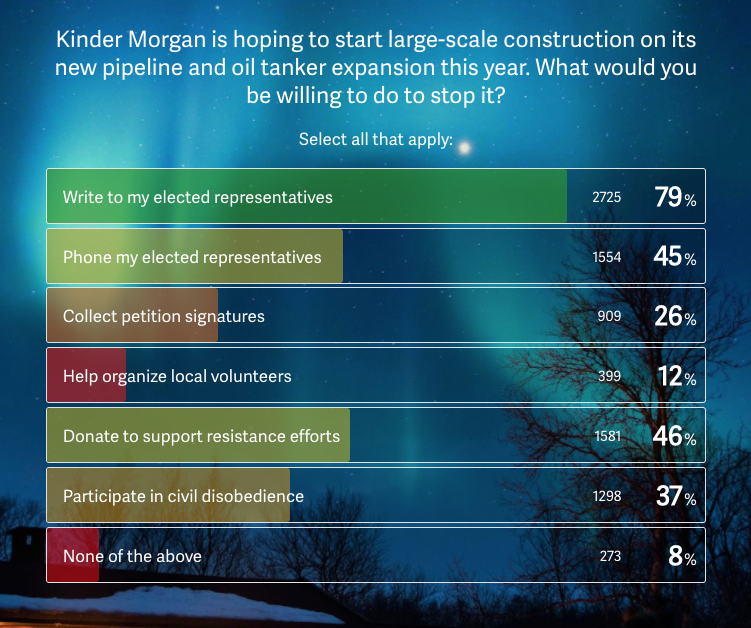 The top choices indicate folks are ready and willing to hold elected politicians’ feet to the fire on Kinder Morgan, and to fund a movement that does just that. 9. 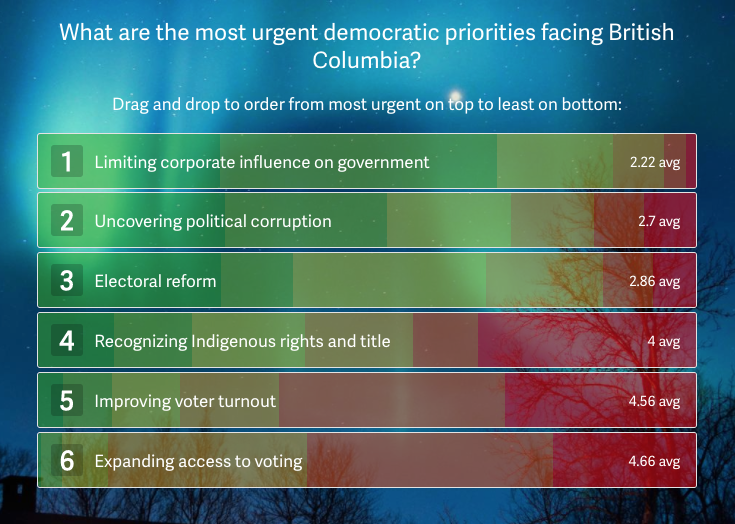 British Columbians want a government that reflects (and answers to) the people who live here. Dogwood-ers are what you might call ‘straight shooters’. A majority of us believe if a person earns a vote, they should get to keep it. Also a top priority for Dogwood folks: keeping local representation. You don’t say?! A big thanks to everyone who participated in Dogwood’s supporter survey! The answers you’ve shared will help inform our future campaigns and strategies. WE need to start a tweet storm to Justin. peoplekind don’t do tar sands @peoplekind, peoplekind settle indigenous land claims fairly @peoplekind, peoplekind don’t ship didbit @peoplekind, peoplekind make polluters pay for the damage they make @peoplekind, peoplekind do not eat farmed salmon @peoplekind. peoplekind place conservation first @ peoplekind. You get the idea. It is heartening to see so many concerned about our environment. It is unfathomable that our federal government has such a callous attitude toward our planet, and to the wishes of BC residents. It sure would be great to be able to motivate all citizens to fight for our planet, not just the enlightened few. We need to inform/educate people/British Columbians about how prorep works. They don’t know that the party has control who runs whether the name goes on a list or they have to get their nomination papers signed by the leader. They don’t understand that with prorep whether one lives in an urban centre or a rural riding one will have representation. The ADVANTAGE with prorep is that there will be MLAs from all parties in the area and one will be able to speak with an MLA one is comfortable speaking to. Rural ridings get more MLAs than under the present system. That has been the experience in New Zealand. Minority governments work well in Scandinavia, Germany etc. In fact they have been able to get much better policies for programs such as health care, education, affordable housing, elder- and childcare, resource management and environment through with minority governments. Comparing us to Israel does not make sense as they are in a completely different situation than BC. The reason why the BC Liberals and Federal Conservatives and Liberals are against MMPR is because they are big tent parties i.e. coalitions. Thank you very much for sending the results of the survey; and for all the positive work this organization does. Thanks. What will you do with these results? Thank you, Dogwood. This is encouraging information. IPCC expert reviewer Dr. Peter Carter’s new book, out today, frames the climate crisis as a crime against humanity. Criminologists/sociologists and Dr. James E. Hansen support this book, which also offers (mostly unreported by media) workable solutions: https://www.amazon.com/Unprecedented-Crime-Climate-Changers-Survival/dp/0998694738 Peter lives in British Columbia, as do I, Elizabeth Woodworth, his co-author who attends the UN Climate Summits. The book’s position is supported by criminologists and sociologists. Glad to see such strong support for proportional representation. Without it, we’re back to good old days of Liberal Party of Canada false majority government. We need Dogwood’s active involvement to win the referendum. Okay, now that priorities are showing up, time for us to do the same. Keep up the good work! Sincere thanks for this commendable effort. Well done. Keep up the good work. All of the surveys leave out the most important challenge, not only for Canadians, but for everywhere else in the world as well, and that is the reduction of numbers in each family. We can no longer afford to have more than 2 children per family, unless you happen to know how the hell we are going to feed them. We can’t leave this decision up to our governments. Even in China, they have found that it takes more than neighbour watches to keep their family numbers down. Keep up the very good work you are doing! Hurrah! representation that is BOTH proportional AND local? Sounds like STV is the best answer. Thank you for all you have done for us. I am joining the team to work to save BC coast. Excellent work, Dogwood. We MUST keep our coalition government in power as there is so much work to do!!! Thank you Dogwood organizers for all you are doing for this wonderful province of BC and for all Canadians. The updates on progress is great. We need to keep fighting for clean land water and air for our children. This is Cascadia. Good to read comments and results of survey. News headlines make the world seem mad and bad because of a minority in power. Additional tankers must be prevented from traversing our coastline until absolute proof exists that should a spill occur it can be cleaned up 100% rapidly. I do not believe cleanup is possible and therefore do not support Kinder Morgan. I campaigned for Jonathan Wilkinson, now my Liberal MP, because he had a history rich with environmentally sensitive organizations. HAH!!! What a letdown and even abandonment. But Kennedy Stewart, NDP MP, who I now support, said in Tuesday’s email that Ottawa is unaware of BC’s coastal resident’s passion for retaining the natural beauty and pristine harbour waters we love. They generally feel like Albertans, that we must be crazy to rurn down this opportunity to turn black tar into cash. I do get that and I therefore think Ottawa is where our fight must focus. Tell Rachel Notley and the rest of the ALBERTANS they can keep their grungy, deadly crude! 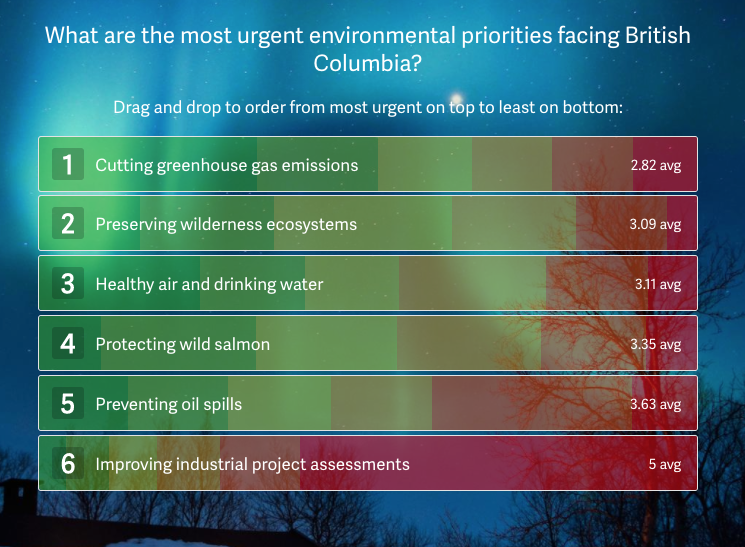 How many BC survey takers were concerned about the affect on climate from the logging industry? Thank you for providing the results of this survey. Every Member of Parliament and MLA in Canada should also have the opportunity to see the results of this survey. YOu are hearing from the converted but even we don’t always get it right. The single most important thing at the moment is to get the voting system changed. The Liberals are fighting this tooth and nails because they know that once the system is changed they will not be able to get a majority government. As long as they can get a majority govt the other things are very unlikely to happen!!!! Too bad housing affordability wasn’t top of the list. Can’t protect our environment without a roof over your head and a country you know cares about its citizens instead of foreign $$$. well done…and very interesting ! Did you decide not to use my comment? Perhaps this is why no one else leaves them? Your survey results are swayed. Should one survey a group of Liberals on who they want as a leader and only the liberals are voting then those results would be a good result. If the same survey was given to the general population then those results would be swayed. As you have only surveyed the dogwood supporters, who are mostly ‘like minded’ then your results are swayed to the beliefs of those people who you have surveyed. I agree. But its not just the Liberals who won’t be able to foist their agenda on us, its all parties. PR will require collaboration and so implemented policies won’t whiplash with each election cycle.